So I got in a good clip of painting in over the last week. I basically had a 4 day weekend as well. That was packed with a ton of great BBQ and family fun, but it also meant I could get a few nights for painting so I cranked out lots of smaller projects. I finally got my Tau ethereal. This is just one of those models I never needed until the new dex. I'm pretty happy with him overall. I am waiting to finish the snow basing until I get the last few models done then I'll knock them all out at the same time. I also painted up Longstrike. 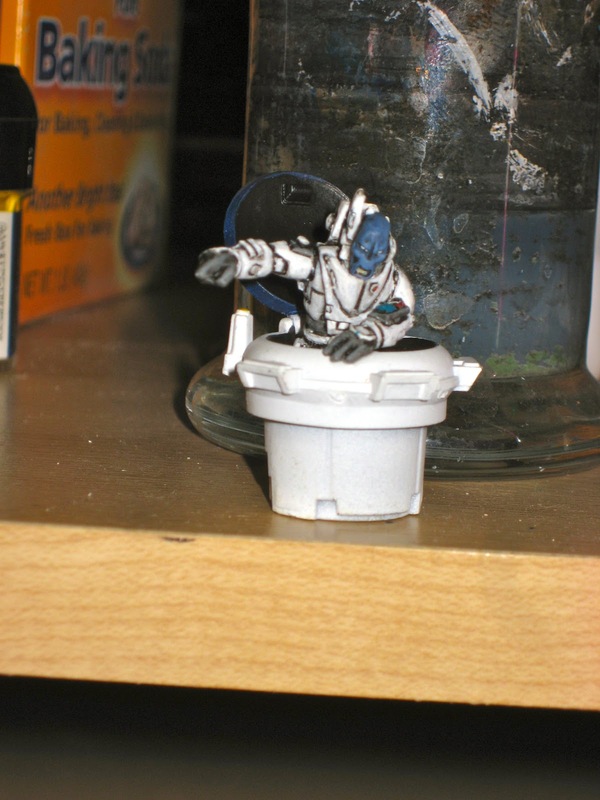 Since he was going to be more 'all white' then the other Tau I thought I'd try using the technique I used on my Sternguard helmets. This basically meant washing black over all the white then doing broad highlights of white. Overall I like the effect though it is obviously not as clean as the rest of the army, it is more realistic. Certainly I could see doing this to all the firewarriors at some point if I could find the time, but then I don't know how silly it will look next to the suits and vehicles. So probably this will be the only model, but hey he's a unique guy. Kroot hounds which I've had 8 forever and just have never been motivated to paint them. So two for my two squads of 10 to give me options. Of course since I'm painting them years after my kroot I had no idea what I had done to get the right color so this was my best attempt to match the burgandy birdmen. I also think the 'frills' look better the solid color washed then the way the kroot are now. So those are another upgrade I need/want to do down the road on the existing kroot. 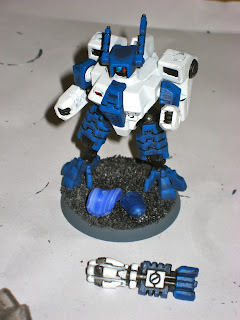 My last crisis suit that I needed to get done and the Cyclic Ion Blaster for the Commander. Though it has a short range I've been liking the option to overcharge so I think I'm going to stick with that for now. I also painted a bit more blue highlights on this Crisis, something I think I might go back for the whole army AFTER this next tournament to an even great degree if I decide to take this to a more soft score heavy event. I've also made some tweaks to my list from the other week. I've decided I will sell out a bit and go with the missile Broadsides. The one shot Railgun is just not cutting it. The plethora of missile seems to indeed be the way to go. I'm not going to go crazy (3 Broadisdes and 6 drones), but keep it modest with 2 and 2 and give them interceptor over skyfire. So a quick hour plus saw the drones done pretty simply. Now I need to work on the Broadsides. Once those are done and get those models based the 2k army is ready to go! The last question will be do I attempt a display board for this event? Given what time I have left and the fact there is no soft score I'm guessing probably not. If the army does well enough and I feel like keeping it in the tourny rotation I do have few neat ideas I'd like to try for the snow themed board though!